Today we will look at Tobbles™. Tobbles™ is an almost full-proof balancing/nesting game. Each piece is designed to be able to balance in numerous positions to create multiple different tower configurations. 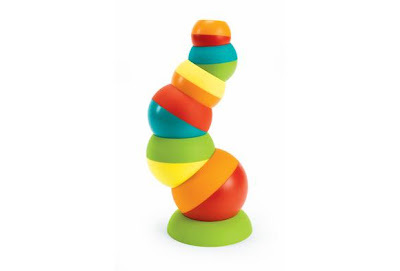 Most importantly, Tobbles allows kids to be successful in stacking while working on fine motor skills. Used in a group, kids can work on turn-taking, social skills, teamwork, and cooperation. · Simple stacking activities. Let the child be creative with his/her designs. · Group activities. Take turns stacking the pieces. · Sequencing activities. Give the child a sequence of colors or sizes for stacking and see if they can follow the sequence from memory. · Color matching. Stack the blocks according to matching colors. For more information about Tobbles™ and other great items please visit http://www.achievement-products.com.